Systems management is more complicated than ever, with a loose coupling of on-premise hardware, software, and cloud services. Having disparate systems like this makes it difficult to know how applications are performing and which areas of your business need the most immediate attention. 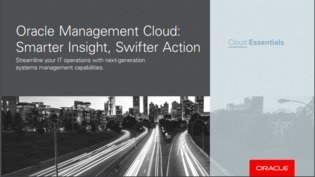 Learn about a cloud service that delivers the next generation of systems management with insights that are instantly available via dashboards streamlining real-time diagnostics, capacity planning, operational forecasting, and business analytics.